A new study has some alarming findings for our planet. 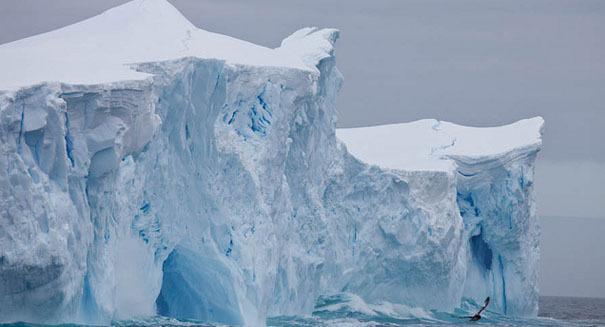 A new study has found that ice in Antarctica and the Arctic is frighteningly vulnerable — more so than most people realize. The study, published in Nature Climate Change, found that the Arctic sea ice extent hit a new January low last month, averaging 5.2 million square miles, 402,000 square miles below the average extent between 1981 and 2010, and beating the record low by 35,000 square miles set back in 2011, according to a Discovery News report. In particular, there was low ice coverage in the Barents Sea, Kara Sea, and the East Greenland Sea on the Atlantic side, and below average ice coverage in the Bering Sea and Sea of Okhotsk. It comes in the midst of new reports that 2015 was the warmest year on record for our planet. This year has not gotten off to a great start, with temperatures across the Arctic Ocean about 13 degrees Fahrenheit above average during January, mostly as a result of the Arctic Oscillation entering a strong negative phase meaning lower air pressures caused warmer air to push north. But despite the natural explanation for much of the temperature increase, the National Snow and Ice Data Center (NSIDC), which released the latest figures, said that the overall trend was unmistakable and the sea ice was declining about 3.2 percent per decade.